When you combine talent and technology, magic seems to happen... If you are looking to spice up your event, we have you covered. Our portfolio is truly limited to the imagination. We hope to inspire you to think big, to be different and most of all to be awesome. If you have seen it somewhere at an event, or can dream of something amazing - we can make it happen. All of the enhancements below are available and can be customized to align with your event, theme or budget. In order to get an exact estimate on the any of the listed services found below, we will ask you to meet with our rockstar team so that we can understand your needs and can recommend the perfect option for your upcoming event. Additionally, if you do not see a specific service or experience item listed below, please know we may offer it but just may not have it listed. If you are interested in seeing your name, logo, theme items in lights on screen, your dance floor or on any wall surface at your event we have the enhancement solution for you.. This effect projects patterns and textures that can be directed on wall surfaces, ceilings, floors, or objects.We usually use this type of lighting at wedding, tents or events that have domed ceilings, but really any surface can be washed with beautiful patterns. Content is king and it is so much more than having "screens" at your event. If you are interested in incoporating technology into your celebration, this feature rich enhancement is awesome. We can have monogram or a slideshow display at your event. 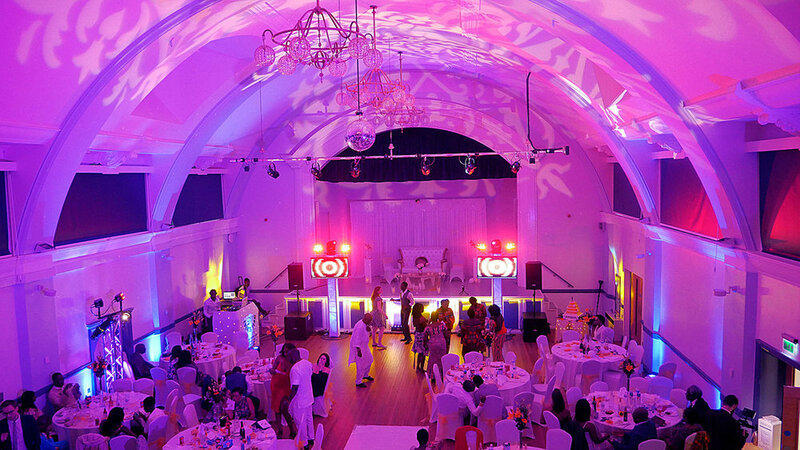 A low-lying fog effect is dramatic and It's widely used for events on stage and especially for weddings. A machine produces a thick, white fog that hugs the floor and dissipates without rising. Sparkling Pyrotechnic Fountains. These fountains are without a doubt the most popular special effect used in extravagant weddings. We transform any given room with uplights,monograms,TV screens and room wash lights to create a flattering lighting design.The right lighting can make or break a room so we use many different fixtures that blends well together.We have two different packages you ca choose from to suit your budget.